England is one of the four countries that make up the United Kingdom. It is a country with over 60 counties in it. 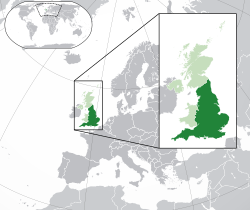 It was formerly an independent country but is now in a union with Scotland, Wales and Northern Ireland. All fourcountries are part of the British Isles and are part of the UK. About 54.8 million people live in England (2015 estimate). The capital city of England is London, which is also the biggest city in the country. Other large cities in England are Birmingham, Liverpool, Manchester, Leeds. In all cases, the population has spread outside the formal city limits, so that the term "built-up area" is often used instead of the city population. The English flag is white, with a red cross. This cross is the cross of Saint George, who is the patron saint of England. Some other symbols used for England are a red rose and three lions. England is the largest part of the island of Great Britain, and it is also the largest constituent country of the United Kingdom. Scotland and Wales are also part of Great Britain (and the UK), Scotland to the north and Wales to the west. To the east and south, and part of the west, England is bordered by sea. France is to the south, separated by the English Channel. The Channel Tunnel, (Chunnel) under the English Channel, connects England to northern France (and the rest of mainland Europe). Ireland is a large island to the west, divided into Northern Ireland which is part of the United Kingdom, and the Republic of Ireland. London is the largest city and the capital. Other large cities are Birmingham, Manchester, Leeds, Sheffield, Bristol, Nottingham and Liverpool. The longest river in England is the River Severn. Other large rivers are the Thames (which runs through London), the Trent and the Humber. England was named after a Germanic tribe called the "Angles", who settled in Central, Northern, and Eastern England in the 5th century. A related tribe called the "Saxons" settled in the south of England. That is why that period of English history is called "Anglo-Saxon". For the majority of this time, England did not exist as a united country. The Anglo-Saxons lived in many small kingdoms, which slowly united. The later countries of England and Wales were formed from the earlier Roman Britain. England became one country in 937. The King of England was Athelstan he changed how the countries in the UK work so that's how the UK was formed. He fought the King of Scotland He lost land to Danish invaders, who formed their own country in the East and North. Many villages and towns in this area (particularly in Yorkshire and Lincolnshire) have Danish names, and use some Danish-based words. At one time Wessex (in the West of England) was the only English kingdom left. After many battles, King Alfred the Great of Wessex became king of the whole of England, and the old kingdoms (Mercia, Northumberland, etc.) just became provinces, called "Earldoms" governed by an "Earl". Soon after Alfred died, the king of Denmark (Knut or Canute) ruled England. England soon had an English king again. When King Edward the Confessor died, Harold (the Earl of Wessex) became king. William the Conqueror, Duke of Normandy (today part of northern France), said that Harold Godwinson had promised to make William the king, so he invaded England and fought King Harold at the Battle of Hastings in 1066. William won, and became king of England. The kings of England spoke French for the next 300 years. England took over the country of Wales in the 13th century. There were many wars, often against France and Scotland. For many centuries the religion of England was Roman Catholicism. The bishops (church leaders) of England and all their churches obeyed the Pope and the church in Rome, Italy. During the Protestant Reformation many did not agree with this. In the 1530s, the Pope told King Henry VIII that he could not divorce his wife. King Henry VIII created the Church of England (a "Protestant" church) partly so that he could divorce his wife. He made Protestantism the official church in England. For the next 200 years, there was struggle over whether the King (or Queen) of England should be "Roman Catholic" or "Protestant". Queen Elizabeth I was Henry's second daughter. She was a powerful queen who ruled for more than 40 years. When Queen Elizabeth I died, she had no children, and in 1603 James VI of Scotland (the son of Mary, Queen of Scots) became King James I of England. He called his two countries "Great Britain", but they were still separate countries with their own parliaments and laws, even though they were in personal union. James' son, Charles I and the English Parliament fought each other in the English Civil War (Scotland and Ireland were involved as well, but the story is complicated!). Oliver Cromwell became leader of the Parliamentary Army (the "Roundheads") and defeated the Royalist Army (the "Cavaliers"). King Charles was beheaded in 1649 and Oliver Cromwell became dictator ("Lord Protector"). When Cromwell died, his son Richard was not strong enough to rule, and King Charles II, the son of Charles I, was invited to come to England and be king in 1660. When King Charles II died, his brother James II was the next king. A lot of people did not like James because he was Roman Catholic. William of Orange was invited to invade England. He was the ruler of part of the Netherlands and husband of Mary, the daughter of King James. Many people welcomed William because he was a Protestant. James left the country without a fight and Parliament asked William and Mary to become King and Queen together. When Mary II of England died, William ruled alone. Queen Mary's sister Anne became the next queen. While she was queen, England and Scotland were officially joined as one country. This was called the Acts of Union 1707. It also merged their separate parliaments. The parliament in London now included Scottish Members of Parliament ("MPs"), and was called the Parliament of Great Britain. After this, the history of England becomes the history of Great Britain and United Kingdom. The United Kingdom was formed in 1800, when the Irish Parliament merged with the British one. Later Ireland fought against this merging and the Republic of Ireland, which is not quite the whole island called Ireland, became a separate country. The rest of the island, Northern Ireland, is now the only part of Ireland still in the UK. England is the only country of UK not to have its own government, Parliament or Assembly, but is governed by Parliament of the United Kingdom. In Parliament England has the most seats. The English language is a West Germanic language spoken in many countries around the world. With around 380 million native speakers, it is the second most spoken language in the world, as a native language. As many as a billion people speak it as a second language. English is an influence on, and has been influenced by many different languages. Some people in England speak other languages, such as Welsh. All of Great Britain has an oceanic climate. There can be a temperature difference of 5-10°c between the north and the south (the north is generally colder), and there is often snow in the north before there is in the south. The prevailing wind for most of the year is from the Atlantic, to the west of England. Therefore, there is more rain on the western side of the country. The east is colder and drier than the west. The country usually has a mild climate because the Gulf Stream to the western side is warm water. The climate is warmer than it was 200 years ago, and now ice and snow are rare in the southern part of the country. Occasionally, air from the Arctic Circle comes down the eastern side of the country and the temperature can drop below 0oC. The English football team won the World Cup in 1966. They came close in Italy 1990, closely losing in the semi-final against West Germany on penalties. In the 2006 World Cup they got to the quarter finals, then lost to Portugal after penalty kicks. In the 2010 FIFA World Cup, they were knocked out in the second round, losing 4-1 to the Germany national football team. Diana, Princess of Wales (1961-1997). Wikimedia Commons has media related to England.